Nothing says summertime fun like country music and the classic combination of pure HersheyÂ®â€™s Milk Chocolate, graham crackers and marshmallows. HersheyÂ®â€™s brand and Rascal Flatts have partnered to help fans celebrate summertime Sâ€™mores with the release of â€œYour Day to Get Away,â€ an exclusive downloadable song. For a limited time, the first 350,000 fans to visit PureSmores.com can download the Rascal Flattsâ€™ song specially crafted for Hersheyâ€™s Sâ€™mores. 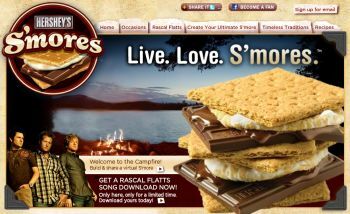 Drop by PureSmores.com to find S’mores recipes, the Rascal Flatts download, and a bunch more S’mores stuff! I haven’t had a s’more in years! They look so delicious I might go out and get the ingredients, just for grins. Oh, I LOVE s’mores….reminds me of my days in Girl Scouts when I’d toast my marshmallow until it was burnt to a crisp, then put the HOT marshmallow on the chocolate bar and watch it melt….take a bite and have the gooey marshmallow stick to your chin with the melted chocolate surrourded by the graham crackers!! M’mmmmmmmmm! I LOVE s’mores!! !